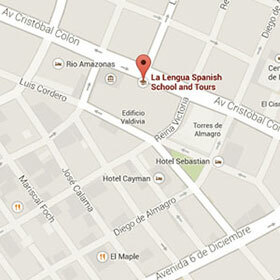 The Spanish School La Lengua offers private Spanish classes and group lessons at flexible hours, all year. You will develop all the language skills, reading, writing, speaking and listening with our program. Our head office is in the modern part of the capital, in the core of the city. Accommodation and meals: You may stay with a family selected by our school. You will get a private room and up to two daily meals. This allows for Spanish practice outside the classroom and integration into community life. You can choose whether you want to stay with the family that has children; or a vegetarian family. DELE (Diplomas of Spanish as a foreign language) is the official accreditation of the degree of fluency of the Spanish language, issued and recognized by the Ministry of Education of Spain. This course takes place before the DELE exam and is focused on the following skills: reading, writing, listening, grammar and vocabulary. The course includes a diagnostic test, study materials and final exam (DELE pre-examination). Quito, Ecuador’s capital city, is located at an altitude of 2850 m (above sea level) in a valley at the foot of Pichincha volcano (4794 m). On clear days, you can even see several distant snow-capped peaks from the Avenue of the Volcanoes, including the Cotopaxi, Ecuador’s highest active volcano. With a population of over two million, Quito is Ecuador’s second largest city (only the coastal city of Guayaquil is larger). Quito enjoys a comfortable climate year-round between 13 and 24 C°. Ecuador’s small size allows for easy and short travel from Quito, with most destinations requiring less than a day by bus. Having been a powerful and rich political center for both, the Incas and the Spanish conquerors, Quito’s well-preserved colonial historic center provides an impressive array of churches and museums. In 1978, its historic center was declared a world heritage site by UNESCO. The city has the best-preserved, least altered historic centre in Latin America. The monasteries of San Francisco and Santo Domingo, and the Church and Jesuit College of La Compañía, with their rich interiors, are pure examples of the ‘Baroque school of Quito’, which is a fusion of Spanish, Italian, Moorish, Flemish and indigenous art.